Three scoring rounds are played. 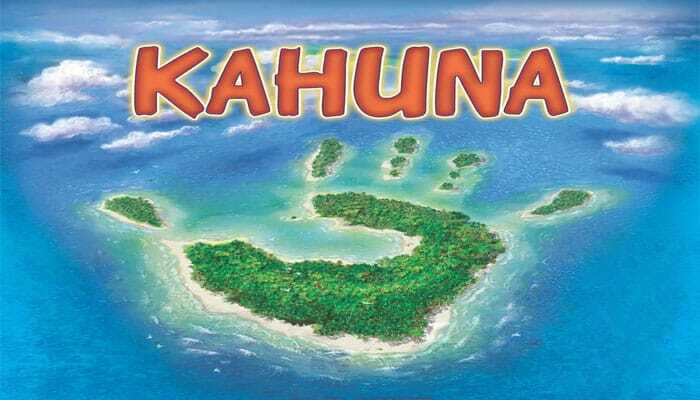 When scoring takes place, you receive points if you have claimed more islands with Kahuna tokens than your opponent. And if you have more points than your opponent at the end of the game, you gain control of the island kingdom and win the game. Place the game board between the two players. Each player receives 25 bridges and 10 tokens of one color, which are placed in front of each player. One player shuffles all of the island cards and gives each player three face-down cards, which the players draw into their hand. To get a better overall view, the cards should be held in such a way that their orientation matches that of the game board (the turtle and dolphin symbols on the board and on the cards help with alignment). Place three more cards face up beside the game board. Organize the remaining island cards face down into a draw pile next to the three face-up cards. The player who more desperately needs a vacation begins. Afterward, the players alternate turns. On your turn, you play any number of your island cards. You may also abstain by not playing any cards. Afterward, you draw one card. However, your hand may not contain more than five cards at any given time. 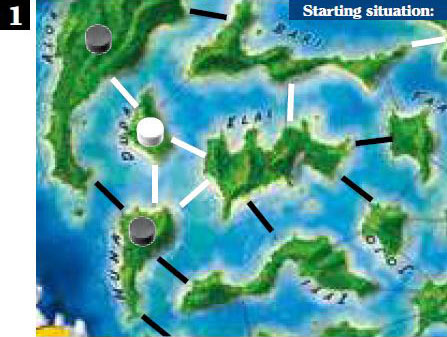 When you play a card, place a Kahuna bridge on a free connecting line that starts from the island indicated on the card (marked in red) and leads to any neighboring island. If you play multiple island cards, play the cards one at a time (except during the removal of Kahuna bridges, as explained in step 3). If you want, you can abstain from playing a card. All played cards are placed on a discard pile. If your hand contains five island cards and you cannot or do not want to play any island card(s), you must place one or more of your cards face down under the discard pile in order to draw a new card. If you have placed your own Kahuna bridges on more than half of an island's connecting lines, you have gained control over it. Place one of your Kahuna tokens on this island. Note: The number of lines below the names of the islands on the cards indicates how many connecting lines (3, 4, 5, or 6) lead off the respective island. Remove all of your opponent's Kahuna bridges connected to this island and return them to their owner. Important: The removal of Kahuna bridges may cause a player to lose control of neighboring islands, with the result that he or she must remove Kahuna tokens from these islands. You can also remove one of your opponent's Kahuna bridges by playing two suitable island cards at the same time. To do this, you must play two cards that each show one of the two islands connected by the opponent's bridge. The two cards can show the same island or both islands. Example: The connection between HUNA and ELAI can be severed by means of one of the following three pairs of cards: "HUNA - ELAI", "HUNA - HUNA" or "ELAI - ELAI". 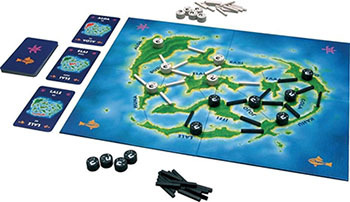 If you can also play another suitable island card (in the example, this card would be HUNA or ELAI) that allows you to place one of your own Kahuna bridges on the connecting line you just removed your opponent's Kahuna bridge from, the implications can be far-reaching (see also the detailed example on page 5 of these game rules). At the end of your turn, draw one card. Regardless of whether you have played no cards, one card, or multiple cards, you may only draw one card. Either take one of the three face-up cards and immediately replace that card with one from the face-down draw pile or draw the top island card from the face-down draw pile. You may abstain from drawing a card, unless your opponent has abstained from drawing a card on his turn immediately before. If your hand already contains five cards, you are not allowed to draw another card. If your opponent has abstained from drawing a card on his turn immediately before and your hand contains five cards, you have to play or discard at least one card so you can draw a card at the end of your turn. Once you have drawn a card, your turn ends. There are two interim scorings. Once the face- down draw pile is depleted and the last of the three face-up island cards has been drawn, the players briefly interrupt the game. 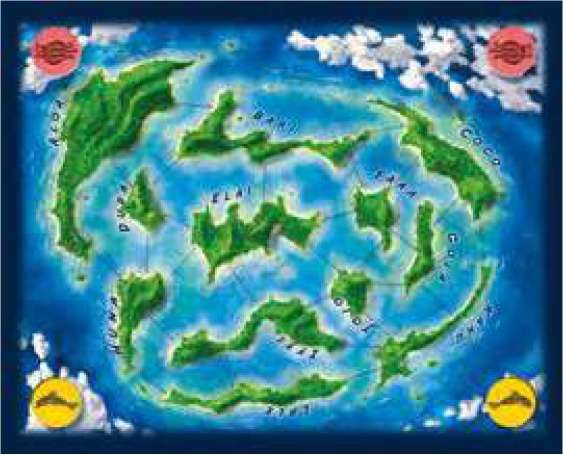 Each player counts the islands he or she has marked with his or her Kahuna tokens. If there is a tie, none of the players receives a point. In the first interim scoring, the player who has more Kahuna tokens on the game board receives one point. In the second interim scoring, the player who has more Kahuna tokens on the game board receives two points. Each player should make a mental note of his or her score or write it down on a piece of paper. Afterward, shuffle the island cards of the discard pile, create a new draw pile and once again place three cards face up. Both players keep the cards they already have in their hands. The turn of the player who triggered the interim scoring ends and the other player takes his or her turn. When the draw pile is depleted for the third time and the last of the three face-up island cards has been drawn, each player takes one more turn. This is the last time they can play their cards. Afterward, the final scoring takes place. The rules for the final scoring are different than the rules for interim scoring. 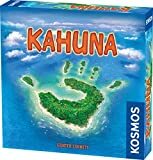 Once more, each player counts the Kahuna tokens he or she has on the game board. The player with more tokens receives points equal to the difference between the players' token counts. The player with the higher point total from the two interim scorings plus the final scoring wins the game. In case of a tie, the winner is the player with the higher point total in the final scoring. If, after the three scorings, both players have zero points, the player who has more bridges on the game board wins. If there is still a tie, there is no winner. If, during the second or third scoring round, one of the players no longer has any Kahuna bridges on the game board, the game ends prematurely. In this case, the other player wins. White's turn: The white player places a bridge between BARI and DUDA 1, gains control over BARI and places a Kahuna token on the island 2. White removes the black bridge between BARI and ALOA 3. As a result, Black loses control over ALOA and must remove his Kahuna token there 4. 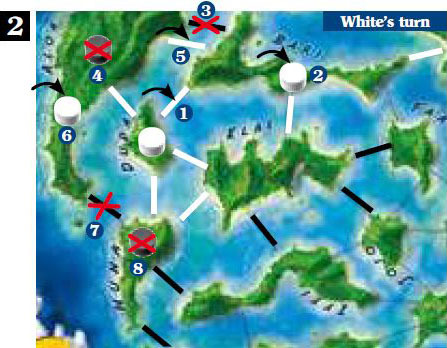 Next, White places a bridge between ALOA and BARI 5. Now he has control over ALOA and places a Kahuna token there 6. 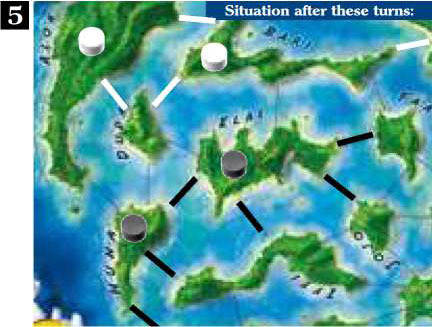 He removes the black bridge between ALOA and HUNA 7, as a result of which Black also loses control over HUNA and must remove his Kahuna token from this island 8. Black's Turn: First, Black plays two HUNA cards and therefore may remove the white bridge between HUNA and ELAIL 9. 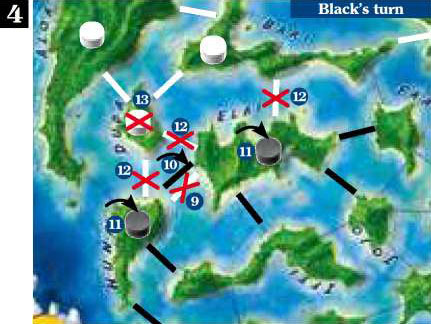 Then, Black plays an ELAI card, places a bridge between HUNA and ELAI 10, and thus gains control over HUNA and ELAI. 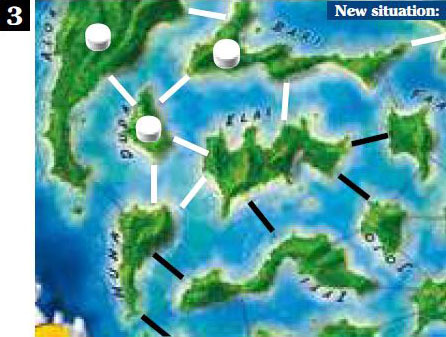 He places Kahuna tokens on each of the two islands 11 and removes the white bridges between HUNA and DUDA, DUDA and ELAI, and ELAI and BARI 12. Furthermore, White removes his Kahuna token from DUDA 13, since he has lost control there as well.